A life without adventure is likely to be unsatisfying, but a life in which adventure is allowed to take whatever form it will, is likely to be short. Some risks such as natural disasters are dramatically obvious, and they affect many people. Hurricanes, volcanoes, and earthquakes can destroy entire communities in minutes. Malaria, smallpox, and sleeping sickness can devastate populations. Other risks are more personal. Crossing busy streets, working in a polluted environment, borrowing money, or failing to contain our anger are everyday risks that most of us face. Consider getting food from the supermarket. We jump in the car and run a risk of being hit by a careless or drunk driver, even if we are cautious ourselves. Once inside the store we are faced with goods that may have been tampered with or tomorrow may be declared carcinogenic or environmentally harmful. On a more minor level, we may discover that the meat we bought was on sale at a competing supermarket. If everyday choices present us with a shower of risks, our major choices are immersed in a virtual downpour. Think of what can go wrong in getting married, changing jobs, or taking a trip to a foreign country. In many of these situations, our choices do not just affect us, they affect many other people. Business and government decisions can influence the risks faced by thousands or millions of others. Risk is a pervasive part of all actions. While eventual death may be certain, every day we engage in activities -- even just crossing the road to mail a letter -- that carry a risk of death. Although death is the ultimate risk, the economic and social risks that we face can be more oppressive. Seemingly secure jobs may disappear in economic hard times. Seemingly stable marriages may shatter for many possible reasons. Life requires choices; choices require risks. While you can choose to minimize the risks you face, you cannot avoid risks completely. Along with death and taxes, risk is one of the certainties of life. Proust-like, we may decide to isolate ourselves in the safety of our homes to avoid risks. However, we still may fall down the stairs, have a plane crash into the roof, be electrocuted in the bath, be assaulted by a burglar, be blown away by a tornado, or be downwind of an unsafe nuclear power plant. We may move to an isolated mountain region to escape from the risks of a city's polluting factories, traffic congestion, and racial tension only to expose ourselves to the risk of inadequate emergency medical services in the event of a heart attack. That many risks are hidden and not foreseen may mean greater peace of mind, but it does not reduce our exposure to their possible negative effects. Primitive man had little control over his environment. The daily activities of acquiring food and shelter were fraught with risk. While modern man has gained some control over his environment and may experience fewer risks in acquiring the basic necessities, a more complex environment has brought new risks. In this century, technology and collective action fill our lives with man-made hazards such as nuclear war or acid rain. Gaining control over some risks has led to different types of risks that may even be more dangerous than the ones that have been mitigated. In general, avoiding one kind of risk will introduce some other risk. By not building nuclear powered energy plants, we run risks of impairing our economic structure by running short of fuel, increasing coal-related disease, and so forth. Some actions appear to be free of risk. We invest our life savings in a "risk-free" savings account insured by the federal government instead of buying mutual funds or we marry our childhood sweetheart whom we have known for twenty years instead of marrying the seductive stranger. Although these actions seem to have predictable outcomes, they have risks of their own. Several years after putting the money into the savings account, it provides little security because of rampant inflation. Investing in mutual funds would have provided better security against changes in the price level. After marrying the childhood sweetheart and building a family, the marriage crumbles because the partners no longer find each other stimulating. Thus even apparently riskless actions have risks associated with them due to unforeseen events or changes in perspective. Nonetheless it is often a useful fiction to think of some particular action as riskless so that other risky actions can be judged against it. We sometimes think that by not taking an action we can avoid risks. You are approached by the chief executive of a multinational firm who wants you to leave your current position to assume the presidency of a small subsidiary. You delay responding so that you can think about the offer and its implications for yourself and your family. A week later another executive is made president of the subsidiary which grows into a multi-million dollar enterprise. By not accepting the risks of changing jobs, you missed an opportunity. Not only can risks not be totally avoided, but most individuals seek risks in at least some aspects of their lives. Uncertainty about outcomes of virtually all important activities provides the excitement that stimulates as well as creating the anxiety that worries. People engage in hazardous recreational activities such as hang gliding and rock climbing, they play the stock market, and they gamble partly because of the stimulation that accompanies the risk. Success itself increases risks as we discover whether we can handle the new opportunities that become available. We must face risks in all aspects of our lives and in the many roles we play. The risks we confront as a business executive or community leader are not the same risks we deal with as spouse or parent. We face personal risks that are financial, physiological, medical, social, and so forth. Risks also affect our careers and the organizations that employ us. Most human endeavors bring major risks. To set high goals of success is to run high risks of failure. We expose ourselves to personal financial risks in several ways. We can live beyond our means when we spend more than our income and wealth can support. We can hold too many of our assets in investments that have a chance of major losses. We can hold too great a share of these assets as highly levered investments that are subject to the control of creditors. In each case loss of credit, loss of an asset, or personal bankruptcy are possible outcomes. During hard economic times unemployment rises and savings dwindle. Individuals with prudent financial investment and expenditure strategies do not suffer the same wide swings in economic well-being as those who sought greater gains with their associated financial risks. Risks to one's physical health can take many forms -- accidents, disease, violence, heredity, diet, exercise (or its absence), personal habits, and so forth. Some physical risks have only minor consequences such as temporary mild discomfort or inconvenience whereas others have more major consequences such as permanent physical disability, severe suffering, or even death. If you are an average American male under age 55, the number of days you lose from your life expectancy has been estimated to be more than ten times as high from motor vehicle accidents as from fires (195 days to 14 days). While indulging in regular coffee drinking will only shorten your life by an expected six days, being 30% overweight will cut your life expectancy by more than three and a half years! Even worse than being overweight is smoking more than 20 cigarettes a day; the risks involved (primarily lung cancer) can be expected to shorten your life by almost seven years. The ultimate risk (among normal activities), though, seems to be the risk of remaining single. It has been estimated that being unmarried shortens a man's life expectancy by nine and a half years (Cohen and Lee, 1979)! Setting high goals can also involve social risks which result in negative consequences if we fail to meet them. The social risk that perhaps affects us most personally is the loss of self-esteem that we sometimes experience in the face of repeated failures. Social risks occur when parent-child relationships within the family undergo change. The normal process of dating exposes the participants to social risks as they experiment with their interpersonal relationship. Joining and participating in any organization or group may lead to social rejection if one fails to be accepted as a contributing member. In its extreme form social rejection can take the form of imprisonment or death when a society imposes its harshest penalties on those convicted of taking antisocial criminal risks. The choice of one's career has many inherent risks. A career as wife and mother has different financial, physical, and social risks than a career as banker or lawyer. The attainment of a chosen career depends upon satisfying its educational and apprenticeship requirements as well as overcoming any other barriers to entry that have been set up. Once a career is established, will it provide the envisioned opportunities and stimulation that are needed for maintaining interest in the career? Will one's performance on the job lead to success and career advancement? One of the greatest risks is changing careers in midlife when we may be less adaptable to change and when there is less time available for adequate career development before retirement. Although everyone makes daily decisions involving risks, not all of us make decisions that result in risks for thousands or even millions of people. Managers of business firms or political leaders, however, continually face such risks. Government officials decide whether to commit us to military ventures and trade wars. They decide on traffic speed limits, drug testing requirements, disposal of hazardous wastes, and so forth. Business managers oversee the building of the cars, production of the drugs, and running of the factories that are the objects of such political decisions. Not all managers, however, are fully accountable for their decisions. While politicians are subject to review by the electorate every few years, many of the decisions are made in a bureaucracy that is well buffered from detailed scrutiny. In business firms job security is not legislated, so bad outcomes for the firms are more likely to be followed by bad outcomes for the responsible managers. In 1976 John deLorean quit his high-paying job as vice-president of General Motors to start his own automobile company. The costs of the machinery and supplies necessary to compete in the auto industry are enormous. Even though no one had successfully created a major auto company since the 1930s, deLorean managed to obtain the financial backing of the British Government by building his plant in Northern Ireland. Unfortunately, the automobile market collapsed just as deLorean was getting his first cars to dealers. With slow sales, massive amounts of money were required to keep the factory going, and in late 1982 John deLorean was faced with the impending bankruptcy of his company. He was charged with being involved in a major drug deal that, if it had been successful, would have provided the funds to keep his company going. Although there was a videotape of a drug transaction, the jury decided that deLorean was entrapped and he was acquitted. John deLorean clearly fits our image of the entrepreneurial risk taker. Most business decisions involve tradeoffs that lead to different risks for employees, stockholders, consumers, suppliers, and management. A decision to close an obsolete plant may save the stockholders money that in the long run can be used for creating jobs. In the short run, however, it throws people out of work. The decision to withhold a drug from the market for further testing may minimize the possible hazards of side-effects and prevent future lawsuits, but it denies many others treatment that could help them now. While many operating decisions made by managers (e.g., which accounting method to use, what inventory level to maintain) seem to have few risks, the strategic decisions are fraught with peril. Consider the Tylenol tragedy in which several bottles of the pain remedy capsules sold in Chicago contained cyanide that caused the death of seven unsuspecting users. Prior to this tragedy Johnson &amp; Johnson, along with many other major pharmaceutical companies, packaged their over-the-counter drugs without any special protective covering to prevent tampering. There was little time to decide what to do as a nervous public demanded action to stop the mounting death toll and Tylenol sales plummeted. There was little information about what was happening and what was causing it. Was the problem a local Chicago problem or was it more widespread? Were only Tylenol products affected and were only the capsules (but not the solid pills) adulterated? Was the cause unintended and restricted to a malfunction in the production process? Was it the work of a madman, extortionist, or terrorist group that tampered with the bottles randomly in selected retail outlets? Johnson &amp; Johnson had inadequate control of the situation as it examined its options to prevent more deaths, to reassure the public, to better understand the problem, to prevent additional tampering of its products, and to rebuild Tylenol sales. If Johnson &amp; Johnson did not recall Tylenol capsules in Chicago, more deaths might result. If the recall were not extended to the national market or to other Tylenol products, some other crazed individual or group might try to copy the tragic tampering to capture headlines or to extort financial gain. If recalled capsules were not immediately and systematically tested, management would not know the extent and source of the tampering until other deaths might have occurred. Facing all these risks simultaneously, the company recalled and tested all Tylenol capsules in Chicago, tested selected lots of capsules from other marketing areas, and thoroughly reviewed their production, testing, and distribution procedures. While these actions were under way, they kept the public informed about the extent of the problem and the steps they had taken to prevent future deaths. Johnson &amp; Johnson assured the public that the tampering had occurred at the retail level and it was restricted to the Chicago area. Three months after the tragedy had begun Johnson &amp; Johnson announced to the public that Tylenol products were being distributed in a new "tamper-proof" package that had three safety features: a foil seal on the top of the bottle, a plastic ring on the cap, and a cellophane wrap on the box. Despite losing most of its very large 35% share of the capsule pain remedy market due to the tragedy, within a year sales had bounced back to over 25 % of the market. Rolls Royce is synonymous with prestige and success. The image of the luxury car, however, did not carry over to the management of the company in the 1960s. A company that relied on aircraft engine sales to provide over 80% of their revenue, Rolls Royce could foresee that their current aircraft engine sales would dry up within a decade. To assure survival, top management decided that they had to obtain a contract for the engines on one of the new generation of wide-bodied jets. After losing out on the Boeing 747, Rolls Royce made a special effort to make a deal with Lockheed. The engines that they proposed supplying for the Lockheed L1011 required a higher thrust than any aircraft engine that had previously been developed. In addition, the engines were to be extremely quiet and durable. New materials would be used and many other technological advances were promised. The contract involved delivery of engines at a fixed cost three years ahead. Considerable late delivery penalties were accepted. The financial commitment amounted to over 90% of Rolls Royce's total assets. Thus the technological and financial risks were enormous. Management believed they were justified in light of the potential gains and the consequences if the risks were not taken. Unfortunately, these difficulties escalated and Rolls Royce declared bankruptcy three years later in February 1971. Does this story imply that large risks should not be taken? Not at all. Several years later, Boeing was making aircraft commitments (for the 757 and 767) that involved three times as much as their total assets at the time. Boeing not only survived, they established a position of strong technological leadership. Although the recession of the early 1980s hit them hard, they were in no worse shape than other aircraft companies. The main definition of the verb "risk" in the Oxford English Dictionary is "to expose to the chance of injury or loss." Early references date back to the seventeenth century. The origin is thought to be Italian (risco) but is uncertain. It is worthwhile to reflect on the implications of various aspects of the definition. First, it is necessary that there be a potential loss of some amount (we will use "loss" as a general expression to include "injury"). Second, there must be a chance of loss. A sure loss is not a risk. Third, the notion "to expose" means that the decision maker can take actions that can increase (or decrease) the magnitude or chance of loss. Therefore "to risk" implies the availability of a choice. This exposure may be to the person making the risky decision or to other persons or groups in the environment. The second definition in the dictionary, "to venture upon," suggests even more of an orientation toward action than the first definition. To the extent that a person has some influence on the state of affairs, he takes risks in order to bring about a more preferred outcome. In 1759 Samuel Johnson was explicit about this aspect when he advocated that we "risk the certainty of little for the chance of much." There is uncertainty about the price of gold at the end of this year but we would not call it a risky situation for you unless there were some consequences to you of the different price levels. Correspondingly, if you knew that a stock that you owned and could not sell was sure to lose half its value over the next month, this situation would not be risky because there was no uncertainty. Hence uncertainty is a necessary condition for riskiness but it is not sufficient. Similarly, potential loss is a necessary condition for riskiness but it is not sufficient. Together, however, uncertainty and potential loss are sufficient for a situation to be risky. In general "loss" is a relative loss. A particular payoff is a "loss" if it is considered worse than some particular reference level of payoff. The reference level may be a zero payoff, the current status quo, a target or aspiration level, or the best payoff available in a situation. Hence even a payoff distribution consisting entirely of monetary gains is considered risky when each outcome is compared to the best possible outcome. While losses are commonly thought of in monetary terms, they may be anything that is of concern to a particular decision maker. Two main forms of potential loss should be considered: (1) an outcome that will make us worse off than some reference status quo position, or (2) an outcome that is not as good as some other outcome that might have been obtained. The first case is easily perceived as a real loss; the second case, an opportunity loss, may not be perceived as easily. Opportunity losses can sometimes turn apparently risk-free situations into risky ones when unforeseen events occur. We shall use the terminology magnitude of loss to refer to either of these forms of loss. For simplicity, in the discussion above we did not distinguish between single events and multiple events, or between single types of loss and multiple types of loss. If outcomes depend on only one event, say weather, the situation is less risky than if they depend on many events (e.g., weather, economic conditions, demographic trends, actions of competitors). Similarly, situations in which choices entail possible losses on only a single dimension, say financial, are less risky that those involving losses on many dimensions (e.g., financial, health, social, career). In summary, then, there are three components of risk -- the magnitude of loss, the chance of loss, and the exposure to loss. To reduce riskiness, it is necessary to reduce at least one of these components. Presumably if all of these elements were trivial, then we would hardly call the situation risky. The degree of risk can be thought of as being directly proportional to the chances and size of the loss and to the degree of exposure of the decision maker to the chance of loss. In some situations risky alternatives have a formalized assessment of the magnitude and chances of loss. For example, a bet on a single number at an American roulette table has a 97.4% chance (i.e., 37/38) of losing the amount bet. Similarly for other casino games, lottery tickets, and the like, we can calculate the chances of loss directly. The amount of loss is, of course, determined by the size of our bet. We also can calculate the amount of the potential gain. In other gambling situations, such as the race track, while we know our potential loss, we have no objective estimate of the chances of loss or of the potential gain. Immediately after the betting on a race closes, and before the race is run, we can compute our potential gain, but we still must rely on our subjective estimate of the chances. Presumably the reason we bet is that our assessment of the chances of our horse winning was sufficiently higher than the assessment made by other bettors. Adopting a Bayesian point of view, we assert that in virtually all situations, a person has some information from which to estimate the chances of the potential gains and losses if they are not given. Hence it does not appear to be a gross oversimplification to consider risky actions that have objectively specified chances of winning and losing. Even when objectively specified chances are given in a risky situation, the decision maker may modify these quantities because he perceives the situation differently from its objective statement. When research and development offer the possibility of improving an existing product, a manager must decide whether to stick with the existing product or to make the improvements. If the manager stays with the current product, the profits will remain at their current levels. Suppose, for example, that an existing product has a profit level of $20 million. If the product is modified, the profits will depend upon the acceptance by consumers. Suppose market research indicates that there is a 75% chance of strong acceptance, resulting in an increase in profits of $4 million, but there is a 25% chance of weak acceptance resulting in a drop in profits of $12 million. Should the manager go ahead? This decision illustrates the basic elements in risky situations. There are two actions. One action (called the "sure action") is the status quo while the other action (called the "risky action") has two possible outcomes, a gain or a loss. If we knew that the gain outcome was going to occur, we would select the risky action; if we knew that the loss outcome was going to occur, we would select the sure action. The problem is that we do not know for sure which of these two outcomes will occur. The outcome that occurs depends on an uncertain event for which we have only probabilistic knowledge. This prototypical risky situation will be called the "Basic Risk Paradigm." It provides a foundation for studying risk. It is helpful to visualize the Basic Risk Paradigm in the form of a decision tree. Figure 1.1a shows the decision tree for the decision about modifying the product. The two actions, "modify" and "do not modify" are shown coming out of a square box, which depicts a choice that must be made by the decision maker. The action "do not modify" leads to the current profit of $20 million. The outcome of the action "modify" is dependent on whether consumers like the new product. The event that they do, labeled as "strong consumer acceptance," leads to a rise in profits to $24 million. If they do not, labeled as "weak consumer acceptance," profits will fall to $8 million. Since the outcome depends on an uncertain event (consumer acceptance), the two outcomes are shown coming out of a circle. The chances, 75% for "strong consumer acceptance" and 25% for "weak consumer acceptance" are noted on the corresponding branches. Thus a square box signifies a choice that the decision maker makes, while the circle signifies an event that is outside the control of the decision maker. Note that the expected profit for the risky action is $20 million. That is, a 75% chance of a $24 million profit and a 25% chance of an $8 million profit would yield an expected profit of $20 million if the uncertain outcome were repeated a large number of times. Since one action yields a sure profit of $20 million, while the other action yields an expected profit of $20 million, this average return cannot be a basis for choosing between the actions. A person's preference or aversion to the "modify" action must therefore depend on his preference for or aversion to the risks that this action entails. The Basic Risk Paradigm is depicted in an abstract form in Figure 1.1b. For most purposes it will be embellished, but the basic structure will always be present. Although most risky situations will have more alternatives, more uncertain events, and more outcomes, the basic form captures the central elements. 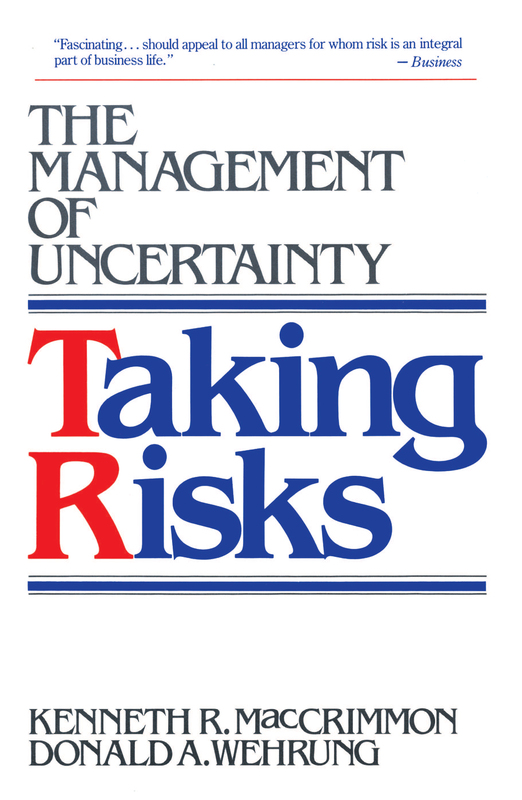 The Basic Risk Paradigm will provide the foundation for assessing risk propensity in this book. The expected value (i.e., arithmetic mean) of a risky action can be calculated as (1 - p) x G + p x L where G is the gain outcome, L is the loss outcome, p is the chance of loss, and 1 - p is the chance of gain. We will sometimes refer to the expected value of a risky action as its expected payoff or average payoff. 1. The sure action does not necessarily have to be the status quo. It can be any action with a sure outcome between the gain and loss outcomes of the risky action. 2. Both actions may be risky, although one of them may be riskier than the other. 3. There may be more than two actions. 4. The risky actions may have more than two possible outcomes. These extensions, as well as other ones to be discussed, can provide a richer context for studying risk than the Basic Risk Paradigm itself. Even in these cases it is insightful to recognize the basic structure. When potential loss is higher, the risks are greater. Introducing the modified product if a $60 million loss can occur is riskier than if a $12 million loss can occur. A $20,000 investment in commodity futures is riskier than a $2,000 investment. Opening a business in a politically unstable foreign country poses a greater magnitude of potential loss than operating the business in North America. When the chances of loss are higher, the risks are greater. Introducing the modified product when there is a 50% chance of weak market acceptance is riskier than if there is a 25% chance of weak market acceptance. Investing in commodity futures involves a greater chance of loss than investing in government bonds. In stable countries we have few worries about our plant being looted and burned; in unstable countries, the chance of losing our investment is higher. When the exposure to chance of loss is higher, the risks are greater. Even if the chances and magnitude of loss cannot be restricted, we may be able to affect the risk by reducing our exposure. Exposure to loss for three distinct entities should be considered: (1) the individual who makes the decision, (2) the decision maker's immediate social unit (usually the family or the firm), and (3) society at large. In the modified product example, outcomes to the firm were discussed because we were primarily concerned with the firm's exposure to risk. The uncertain market acceptance of a modified product could also be translated into potential losses for the manager (e.g., loss of reputation, incentive bonus, or job) or consumers (e.g., unavailability of preferred standard product). In Ford Motor Company's decision on the location of the gas tank in the Ford Pinto, the exposure to risk was very different for the executives who approved the design, Ford which had to pay the lawsuits, and the consumers who were injured or died. Sharing or spreading risk is the most common way to reduce exposure to the individual, family, or firm. This method does not reduce the total loss that is incurred; it just redistributes the exposure to loss among a number of individuals. Inherent in all risky situations are three identifiable determinants: lack of control, lack of information, and lack of time. If we had complete control over the situation, we could determine the best outcome and there would be no risk. If we had complete information about which event would occur, we could select the best alternative based on this knowledge and again there would be no risk. If we had unlimited time in which to decide which alternative to choose, we could wait until the outcome of the uncertain event was resolved and then choose the best alternative after the fact. This scenario also involves no risk. Events are uncontrollable for a variety of reasons. The pure uncontrollable events are determined by nature -- earthquakes, oil formations, weather, and so forth. Next come events determined by other people, including large aggregates of people, such as the actions of competitors, demand for a firm's product, election results, etc. While there may be a distinction between the controllability of next year's weather versus next year's economic climate, they both seem equally uncontrollable to most of us. When the events are determined by specific people, for example the price of a competing product, we must consider the unpredictability of human behavior. Another reason for lack of control is lack of suitable resources. You could control the price of silver next month if you had the resources of the Hunt brothers (and lack of control exerted by the SEC and others). You could even affect the weather with suitable amounts of chemicals and airplanes for seeding. Control requires not only potentially controllable events and the appropriate resources, it also requires suitable opportunities to intervene. In order to control a risky situation, we need information on which to base our control actions. In order to know how to control something by pushing the right button, we have to know which button does what. Since control requires the deployment of resources, we have to know the effect of using our resources in one fashion rather than in some other way. To control or influence someone else's behavior, we need to have information about that person's beliefs and preferences. In addition we need time to develop the control options and to gather the required information. Therefore we will have a lack of control whenever we lack information or time. There are many reasons why there may be a lack of information about the risks in a situation. Since the world never exactly repeats itself, no situation is perfectly identical to what preceded it. No one has any experience with the long-term effects of nuclear energy or genetic technology. On a more mundane level, no one can tell what clothes will be in fashion next year or what the price of gold will be next month. Even if we were prepared to pay to learn more about such risks, there is nowhere to turn. In many other cases, a particular decision maker may have his uncertainties at least partially resolved by information possessed by others. You may not know whether anyone has died from eating tomatoes, but presumably some medical experts know. If you wanted to acquire more information about the dangers of tomatoes, you probably have a general idea of how to begin to explore the question, but you do not know specifically what you will discover. In another area, you may not know whether Texas Instruments has ever failed to pay a dividend, but you know financial information is available that would answer the question. The cost of finding out a sure answer to this question is low. Some information on virtually any question can be purchased at a price. We can find an "expert" who will advise us on the future price of gold or the ramifications of new technology, but we may have little confidence in the reliability of the information we receive. Some events seem essentially unpredictable, although different people may have different opinions on what is unpredictable. After all, gold experts and futurists thrive. Even if information is available, and we believe that it is reliable, does this imply that we should obtain it? For many events in which reliable information could be obtained, the cost of acquiring the information is prohibitive. Any gain that we might expect to attain from having the information would be more than offset by the cost. Extensive market research could indicate how a new advertising campaign would be received but it may be cheaper to run the ads and react to the effect than to do the study. It takes time to gather information, and there may not be sufficient time to gather the needed information for the decision at hand. Many employees have lost their jobs because they delivered an information-filled report to their superiors after the key decision deadline had passed. Therefore situations in which there is a lack of time are necessarily situations in which there is a lack of information as well. Crisis management situations are inherently risky. Decisions must be made quickly with little knowledge of the options available, the uncertainties involved, or their consequences. Events happen rapidly so crisis managers lose decision options when they do not act quickly. If decisions could be made after key uncertain events had occurred, situations would not be risky. It is the requirement of risky situations that decisions must be made before the key uncertainties are resolved that makes time such an important factor. When the time is insufficient, people cannot understand fully or reduce the magnitude or chances of potential losses to which they are exposed. With insufficient time new control options that could affect exposure to a chance of potential loss cannot be developed. Even when the degree of control, information, or time is insufficient to eliminate all risk in a situation, these elements can be used to mitigate risk partially. Having partial control over uncertain events allows us to influence which outcomes occur without determining the specific outcome. For example, a firm that has partial control over its labor costs, sources of supply, and the like can shape its production environment to its advantage. Having relevant information on uncertain events allows us to project the likelihood of the possible outcomes and to take steps to reduce our exposure to the events causing the risk. For example, a firm that knows what changes in labor costs, sources of supply, and so on are occurring over the next few years can take steps to expand or contract its operations accordingly. Having additional time allows us to develop new alternatives for handling risky situations even if we cannot wait for the resolution of the key uncertain events. In summary, risk as the exposure to a chance of loss is proportional to the lack of control, the lack of information, and the lack of time. Table 1.1 illustrates the relationships between the determinants of risk and the components of risk. What do you mean when you describe a business situation as risky? What are the important characteristics of a risky situation? About half of the executives responded by identifying specific uncertainties that made their business decisions risky. Frequently mentioned were uncertain events external to the firm concerning product, supplier and financial markets, governmental regulation, and general economic conditions. Factors internal to the firm were also cited including uncertainty regarding labor unrest, technological innovation, management inexperience, and insufficient management resources. The lack of information on these uncertain events or their unpredictability was often mentioned. Most of the remaining responses described situations as risky when there was an unacceptable chance of loss or gain, an imbalance between possible losses and gains, or high stakes involved, or when firm survival was at stake. Perhaps the best way to communicate the interplay among the components of risk and the determinants of risk is to present several of the managers' responses (italics added). "A risky situation is one in which I personally have little or no effective control; one in which outside factors dominate, e.g., political situations, strikes, foreign exchange fluctuations, etc." "...a situation where there are unknowns involved, caused by either lack of time to research them or lack of sources of research." "Risky means to proceed based on limited knowledge." "Situations are risky when there is lack of experience by management, lack of funds to proceed properly,...lack of proper planning, or lack of market research." "There is a high degree of loss in undertaking the situation." ".....a situation where the probability of success is outweighed by the probability of failure, with something of value being gambled (not necessarily money)." "High probability of failure due to known threats and weaknesses which are not offset by commensurate rewards." Thus the managers tended to view risk in a manner similar to the concepts we have presented. This survey also provided a check on our view of risk in that there were no general aspects of risk mentioned by the managers that could not be readily related to our framework. Do People Agree on the Riskiness of Situations? We are all aware of both societal risks and personal risks. The decisions of political leaders in countries as remote as Iran or Libya may plunge the world into a war that could obliterate the ordinary patterns of life. Decisions without aggressive intent, involving energy generation or genetic engineering, could have similar effects. Many other factors can have a potentially devastating effect on a national, regional, or local level. As we decrease the scope of the area affected, we greatly increase the number of risks. In addition to all the macro events, you face risks in what you choose to eat, where you live, when you go to work and so forth. There are various situations that virtually everyone would agree are risky. Flying in planes with cracks in the wings is riskier than flying in well-maintained planes. Investing in soybean futures is riskier than putting money in a savings account. Living in an urban housing project is riskier than living in a well-policed suburb. Working in an asbestos factory is riskier than working in an office building. On the other hand, there are many zones of disagreement. There has been a continuing controversy about the risks of nuclear energy plants as contrasted with the alternatives. In fact, one position has been that windmills are more dangerous than nuclear plants. Most people would agree that a major earthquake along the San Andreas fault could cause tremendous damage and loss of life. Such a situation would be deemed riskier than a major snowstorm in Chicago. However, if we live in Chicago rather than Los Angeles, a snowstorm might pose greater risks to us than an earthquake. Whether a situation is perceived as risky by a person depends on his own exposure, or the exposure of others he cares about. The further one is away from the conceptual "ground zero" of a risk the less personal risk is perceived. One can think of many situations that pose massive risks to other people, but these situations will only elicit action when people perceive things they care about (including abstractions such as human rights) as being threatened. Thus, it makes little sense to talk about one risk being greater than another, without addressing the issue of riskier to whom. Since the risks we perceive depend on where we stand, we will experience different levels of risk in different parts of our lives. One executive continually may be in the center of business situations that are fraught with tremendous uncertainties and hazards, yet have a peaceful family life. Another executive may operate in a relatively stable business environment, while facing turmoil and upheavals at home. Risky situations, as we have discussed, involve two or more alternatives where at least one alternative exposes a person to a chance of loss. The central focus in the traditional "choice" view of risk is on the alternative a person chooses. The alternatives in such risky situations differ in their riskiness. If we know the riskiness of alternatives, the risk behavior of a person can be assessed by looking at his choices. A person who is risk-averse will select one of the less risky alternatives while a person who is a risk taker will select one of the more risky alternatives. Clearly we need to ascertain the riskiness of each alternative. If two alternatives are the same except that one has a higher chance of loss, then that one would be riskier. If two alternatives are the same except that one has a higher magnitude of loss, then that one is riskier. If two alternatives are the same except that one has a higher exposure to loss, then that alternative would be riskier. When alternatives differ in the chances of loss, magnitude of loss, and exposure to loss, we need some way to assess their riskiness. If the alternatives have the same expected value, then some measure of the variation in the outcomes can be used as well as the three principal components of risk. This focus on choice captures the core of a risky situation -- but only the core. At some point a person will make a choice, but a lot of things happen before the choice is made. Knowing these things can often tell us more about risk behavior than the choice itself. Most risky situations require a person to figure out what the possible alternatives are, instead of having them nicely presented. Most risky situations allow a person to modify the risky situation before having to choose. Both these steps require a structuring of the situation rather than a choosing. The narrow "choice model" of risk will be broadened to incorporate "structuring" actions as well. So far we have explored how risky situations involve exposure to a chance of loss. In studying risk, however, we must examine not only risky situations but also the behavior of people confronting risky situations. How do people recognize risks? How do people evaluate the risks they perceive? How do they try to modify the risks they face? Are some people more inclined to take bigger risks? Managing risks starts off with an initial recognition that a risky situation exists. A person acquires some information about a situation that may result in his losing something of value. Although an omniscient outside observer may be able to make an "objective" appraisal of the risks, the decision maker himself may perceive the situation in a very different way. Clearly, it is the way the decision maker sees the situation that will determine how he acts, whether or not his perceptions accord with reality. Yet it is reality that will determine the outcomes. The risks in some situations (e.g., speculating in commodity futures or sky diving) are obvious. A person's perceptions depend on what he has learned from others about risks (e.g., in speculating or sky diving) even if he has not engaged in such activities himself. Risk perceptions will also depend on the past experience and the skills of the person himself. If you are an experienced mountain climber, you may not face, or even understand, the risks of a novice. To assess one's exposure to a chance of loss, we first need to examine how people perceive losses. Most of the examples so far in this chapter have involved monetary losses. In many risky situations these monetary losses could be viewed either from the perspective of actual, out-of-pocket monetary losses or as opportunity losses relative to the best decision that could have been made knowing the event that occurred. Whether you perceive the losses as actual or opportunity losses can influence the choices you make, especially if you are susceptible to regret. Although losses are usually measured monetarily, there are other types of losses that might be considered in risky situations as well. Executives are frequently concerned with loss of prestige or reputation, loss of management authority, and loss of rapport with superiors, employees, suppliers, and so on. Concern for these nonmonetary losses means that risky situations are not always perceived solely in terms of their monetary losses. The presence of nonmonetary consequences complicates the typical diagram for the Basic Risk Paradigm because in this case each outcome must be described by at least one additional attribute together with the monetary consequence. How do people perceive uncertain events? Uncertain events that depend upon mechanistic random devices such as roulette tables, playing cards, and dice are usually seen as subject to the laws of probability. The best one can do in these situations is to understand the probabilities of the relevant events and make choices consistent with them. Uncertain events that depend on natural forces such as the weather or large aggregates of people (e.g., claims on insurance policies) may occur often enough so that these observations can form the basis from which frequencies can be derived to predict future occurrence. If the uncertain events have not occurred before, no evidence is available on which to base the probabilities, so only subjective probabilities are possible. Uncertain events that depend upon the actions of specific individuals or groups such as competitors, labor unions, or regulatory agencies may or may not have occurred before, so frequency data may not be available. In addition such events may be subject to control by the decision maker because the other actors may be influenced to change the result of the uncertain events they determine. Thus depending upon the source of the uncertainty, a decision maker might perceive an uncertain event as (1) unpredictable because few, if any, similar events have occurred, (2) predictable and subject to known laws of chance, (3) predictable and subject to estimated laws of chance, or (4) controllable (partially or totally) by the decision maker. Likewise exposure to loss is perceived quite differently by different individuals or groups. Investing $100,000 in unproved new machinery is a drop in the bucket for General Electric, but may be extremely risky for a local machine shop. Quitting a steady job to undertake an entrepreneurial venture may be relatively easy for a young unmarried MBA with highly marketable skills, but may be fraught with peril for a 50-year~old executive with several dependents and narrow employment opportunities. Whenever the components of a risky situation are not explicitly stated, a person's perception must be subjective because the components are not well defined. But even when such risk components are explicitly stated (such as the increased chance of dying from lung cancer when one smokes a pack of cigarettes a day), a person's perception is still subjective because of the personal nature of internalizing chances, losses, and exposure. Data show that the chances of a person being seriously injured in an automobile accident at some time in his life are about 33% (Slovic, Fischhoff, and Lichtenstein, 1978). When presented with this information, you might be tempted to dismiss it. Even after finding out it came from a reliable source, you still might discount the information in various ways. You may discount the one-third chance by transforming it in your mind to "a small chance." You may discount the loss by assuming that if an accident occurs, it will only result in minor injury. You may discount the exposure by thinking that, although the chances and magnitude may apply to other people, you are such a careful driver that your potential exposure is much less than that of other people. After initially recognizing and structuring a risky situation, a decision maker makes a preliminary assessment of the acceptability of the risks. If he is already in the situation, does he want to stay in or to get out? If he is outside of the situation, does he want to get in or to stay out? Most thinking about risk assumes that an individual is already in a risky situation. He may have chosen to enter the risky situation or he may have been thrust into the situation as a result of circumstances beyond his control. People are in the center of many risky environments and they may encounter many risky situations in these environments. The individual overtly acts to expose himself to some of these risky situations; others he overtly acts to avoid, while others he accepts as they confront him. In each case the individual evaluates the acceptability of the risks. There is frequently uncertainty about the nature of the risky situation that is being confronted. For example, consider the risky environment of foreign operations in an unstable country. The macro-level decision in this example is whether to get into foreign operations in this country that will involve unknown risks. Until the decision to enter is made, one may not know whether unreliable labor or political instability pose the greater risks to the firm. If the individual finds the risks unacceptable, he can decide to opt out (stay out) of the risky situation. If he decides to opt into (stay in) the risky situation, he then confronts the risky situation whose risk components become known with time. For example, after beginning foreign operations the firm learns that the lack of reliable labor is the principal source of risk in achieving acceptable profit levels. Once in the risky situation, the individual faces risks with known decision alternatives, uncertain events, magnitudes and chances of loss, and exposure. For example, the individual must choose between importing higher-priced reliable labor or using the unreliable local labor and risking a chance of loss if the local labor is insufficiently productive. Although a micro-level perspective is normally used to observe risk behavior within risky situations, we can also use a macro-level perspective to investigate risk behavior. When a person is outside of a risky situation, the macro-level decision is whether to stay outside or enter the situation. When a person is in a risky situation, he must make the macro-level decision whether to stay in or to opt out. Knowles (1976) discusses these two perspectives. We will make a distinction between passive and active risk behavior in a risky situation. Active behavior involves trying to adjust the components of the risky situation. For example, one may try to reduce the chance of loss, reduce the magnitude of the loss, or reduce the exposure. Passive behavior simply implies selecting from the alternatives presented. If one is inclined toward risk, one selects a riskier alternative, while if one is inclined away from risk, one selects a less risky or sure alternative. Many of us treat risk in a passive manner. If a risky situation arises, we consider the alternatives and choose in accordance with our like or dislike of the risk. We neither seek out such situations nor do we shun them. When they occur, we do not try to change them; we simply choose. Other people, though, actively try to change the risky situations that they confront or try to change the components of the alternatives from which they must choose. Let us consider, in some detail, the ways in which such "active" and "passive" types might behave in a business context. First, in actively seeking or actively shunning risky situations, a manager signals his propensity for risk. In the area of takeovers and acquisitions, the risk-seeking manager will be looking around to see which firms he should acquire and will not be particularly daunted by the prospect of a takeover fight with another firm. The risk-averting manager, on the other hand, will be more concerned with protecting his firm from being acquired by another. By buying back his own firm's stock and other maneuvers, he can try to shelter himself. Note, then, that it is not contradictory to talk about an active approach to risk avoidance. The passive manager will not make any moves to seek or avoid takeover prospects. Second, when faced with a risky situation (e.g., another firm has made a bid to take over the firm), a manager may exhibit an active stance in handling risks. In this case, the active stance is more likely to be one of lowering the risks rather than raising them, but conceptually it may be either. By various blocking moves (e.g., court injunctions) a manager may try to lower the likelihood of a successful takeover. By working out an agreement with the acquiring firm, he may be able to reduce the magnitude of the loss or the exposure. A more overt risk-seeking response would be to pursue an acquisition oneself (so that it would be too expensive to complete the takeover) or even to take steps to acquire the attacking firm. The truly passive manager, on the other hand, would be considering the choice of whether or not to offer his shares. That is, he would be choosing only from the alternatives explicitly presented. People who take an active approach to risk are likely to attempt to modify the risky situations they confront by gaining time, information, and control. Time allows information to be gathered and exposure to be assessed within the risky situation. Delaying decision deadlines allows other options to be considered. Delay sometimes allows a cloudy situation to clarify itself before commitments are made. Information can be collected on the likelihood of various events and their outcomes as well as on possible new control options. Control over the exposure can be affected by buying insurance, delegating the decision to others, and so forth. Risk modifications are not costless. To gain information or acquire control in one area, one must give up something in some other area. Resources allocated to improving product quality are not available for generating more sales. Current levels of resources determine the extent to which information may be gained or control may be exercised. Likewise delaying a decision may reduce choice options if key deadlines are missed. We can group actions to adjust risks into two categories: (1) those actions that modify the general system outcome (i.e., the chances of the undesired event occurring or the overall loss if the event does occur), and (2) those actions that modify the distribution of consequences among the individual, family, firm, and society (i.e., the exposure), without changing the system outcome. From the point of view of a homeowner, building a dike to prevent a river from causing flood damage falls into the first category, while buying insurance falls into the second category. Moving personal belongings to a location not threatened by flooding could be put in either category depending on how the "event" is defined. Consider the risk of burglary and the possible actions we might take to reduce the risks. By placing valuables in safety deposit boxes, we can reduce the amount of loss if the burglary occurs. In general the magnitude of loss can be controlled by transfers of resources. Valuable paintings can be moved away from flood threatened areas. Seeding a hurricane may divert it to less populated areas. By installing a security system, we can decrease the chance of a successful burglary and thus reduce our chance of loss. Ultimate control over the chances of loss is total prevention of the risk-inducing event. In some cases, when the chances are public knowledge such as gambling bets, one might choose the bet with the lower chance of loss. For example, one might bet on the pass line at craps rather than on roulette. Seeding clouds might reduce the chances of a hurricane causing a particular level of damage by reducing the wind velocity. A common way to reduce personal exposure to loss without reducing either the chances or the magnitude themselves is to share the risk with someone else. Purchasing insurance is a control mechanism that reduces personal exposure in this fashion. Insuring your house, car, or other valuables against theft does not reduce the chances or magnitude of loss if a theft occurs, but it does provide an offsetting effect. The insurance proceeds help to mitigate the loss. The general mechanism for changing exposure is contracting with others. Insurance contracts cover life, disability, health, property, and a variety of other domains. These insurance contracts guarantee a specified monetary payment if particular events occur. Other forms of contingent contracts guarantee other types of actions when particular events occur. When there are many possible uncertain events and the future is less foreseeable, such contracts become more difficult to write. Interesting analyses have been done on the effect of contracting on the subsequent behavior of the individuals facing the risk. A reduction in exposure (through purchasing insurance, say) may make the individual less careful (e.g., leaving his house unlocked or not putting his valuables in a safety deposit box) and hence may increase the chances of the event or the magnitude of loss if the event occurs. This is called the "moral hazard" phenomenon. The most common case in which the magnitude of possible loss is known is when the situation requires an investment or a stake, which can be totally lost. Betting $10 on a horse or investing $10,000 in a mining company limits the amount of possible loss. In other cases the magnitude of loss is not known, so we can adjust the risk by gaining information on the size of the potential loss. Having one's jewelry or art appraised provides information about the size of their monetary loss in a burglary. Gambling situations are about the only risky situations in which the chances of loss are clearly stated. Even on horse races, however, the chances of winning and losing are not known and must be estimated by the bettors. By collecting information about the rate of burglaries in the neighborhood, a very uncertain situation can be made more certain. Even after finding out how likely an event is to occur and how much loss it may cause, you still may not know how you are likely to be affected. General information may tell you that the chances are one in a hundred of a house in your neighborhood being burglarized this year and that the average loss is $2,000, but this may not provide specific enough information about your particular exposure. More detailed information on the exposure of your home to burglary might be obtained by a detailed assessment from an expert on home security. Table 1.2 summarizes how the decision maker can recognize, evaluate, and adjust the risks he faces before having to choose a course of action. Choice, as we have observed, is at the core of risk taking. Yet it should be clear that the risk adjustments that are made can often do more to affect the final outcomes than making a choice from the alternatives that initially presented themselves. Some of the adjustments, such as delay or delegation, may be so extreme as to obviate the need for a "final" choice. In most cases, though, some choice is necessary. After arranging for partners to share the costs of an oil drilling program, arranging for insurance to cover disasters, delaying until the weather or political climate is better, and collecting information about the geological and economic prospects, a decision must be made: go or no go. After making a basic choice in a risky situation, the outcome will be affected by factors outside one's control. Events will occur that make the anticipated outcomes either good or bad. We can exert only so much control, and so some residual uncontrollable forces will partially influence our destiny. Outcomes are the general results of our choice and of the uncontrollable events. For example, in an oil drilling context the outcome would be the extent of the oil discovery. In the process of adjusting the risks, however, the decision maker likely affected the impact of the general outcome on his personal consequences. A firm that has sold off a large part of its rights may experience very little of either good or bad general outcomes. After taking actions in a risky situation, it is usually necessary to monitor the results. In fact, even if one opts out of the situation it may be desirable to track what is happening. Situations do not occur in isolation. One risky situation dissolves into another. There are no one-shot decisions. Even decisions that seem irreversible usually have outcomes and consequences that allow subsequent actions to assure that the longer-run results are closer to what we want. Since risk is created by the possible occurrence of uncertain events, at some point we will learn which events occurred. The decision maker may have taken actions to prevent, or at least lessen the chances of the events, but the actions may not have had the desired effect. Our house may be burglarized this year even if we have set up a burglar alarm system. The union may go out on strike even if we make a more generous offer. In some cases it may be necessary to expend resources to discover if the events have occurred, but if these events have adverse consequences we are likely to discover them sooner than we would like. The occurrence of an event will lead to general outcomes that usually affect a number of people in the situation. An event like a strike can have major implications on the striking employees themselves, on employees who do not go out on strike, on customers, on suppliers, and on many others besides the firm we are focusing upon. The general outcomes reflect to some extent whether we have been successful in mitigating the overall impact of the risk-inducing event. If the decision maker took actions not just to lower the chance of the event and its general impact, but to lower his own exposure, then the personal implications for him may be less than would otherwise be the case. Most common are risk-sharing agreements such as insurance, in which others have been brought in to reduce the personal impact. While burglar alarms did not prevent the burglary and while hiding the jewels did not lessen the overall loss when the burglary occurred, having insured our goods mitigates our loss. Whereas the general outcomes reflected the efficiency aspects of the risk behavior, the specific outcomes reflect its distributional aspects. When looking at risky decisions there is a danger we may consider a particular decision in isolation from other situations. All the actions taken in a given situation, and all the outcomes that occur, have ramifications for many other situations for the decision maker we are studying as well as for many others. The loss from a burglary, a sour investment, or a strike may affect the way we think and act in the contemporaneous situations we face. The impact of some risky situations may have long-lasting and broad effects. Thus we can think of the last stage in one risky situation as being the first stage in some other risky situation. In fact, in many cases such as business investments or personnel decisions, it is hard to separate out a single incident from the whole portfolio of risks. How we handle one situation, quite apart from the outcomes that ensue, will affect the way we approach the other decisions in the same portfolio. We have described an active way of managing risky situations. Choice is just one part of the management process. How we initially recognize, frame, and structure a risky situation will determine what choices we consider. We cannot make choices that we cannot recognize. Prior to making choices people invariably evaluate the acceptability of the risks and try to change them to conform to the types of risks they wish to take and to avoid. There are a variety of adjustment actions centered on gaining time, gaining information, or gaining control. Such adjustment processes can be viewed as a restructuring of the risky situation. These structuring phases (i.e., recognizing, evaluating, and adjusting) are key factors in handling risk. They are, unfortunately, aspects that have tended to get overwhelmed by the heavy emphasis on choice in studies of risk behavior. Even some aspects of choice have received relatively little attention. For example, the decision involving opting in and opting out of risky situations has frequently been taken for granted. However the evaluation on which such decisions are based provides the framework for later adjustments and choices. Overall, then, we have presented a model of managing risk that has five phases: recognizing and structuring the risks, evaluating the risks and deciding whether to be in or out, adjusting the risks to be more in line with what is desired, choosing among the risky actions, and finally, tracking the outcomes. The initial letters of the five phases suggest the name REACT for this model of managing risk. This name has the virtue of stressing the active rather than passive nature of handling risk. It should not be taken to imply, though, that one simply sits back waiting for things to react to. A decision maker can recognize an opportunity and initiate a risky situation himself. Figure 1.3 shows how the various phases of the REACT model fit together. Perhaps it can be reinforced by use of an example. Suppose you recognize an opportunity to sell some of your firm's products to the government. For example, you may have seen a list of tender proposals. You initially begin to structure the situation: how many products will you sell, at what price, produced in what plants, and so forth. Based on this initial structuring, you evaluate the risks and decide whether you want to get "in" -- that is, to bid on the contract. At this point there are a number of uncertainties that will need to be considered at subsequent stages. If you decide to get in, you can now try to adjust the situation to your advantage. You can gain time by bidding on contracts with due dates that are further away or by asking for an extension. You can gain information on chances, magnitude, and exposure by finding out under what terms recent contracts have been won. You also can compile further information about your firm's capabilities and costs. You can gain some control over chances, magnitudes, and exposure in various ways. The chances of loss can be reduced by affecting the uncertain events. For example, the prices charged by your suppliers can be fixed through long-term contracts. This will protect you against possible future price increases. The magnitude of the losses can be reduced by offering to supply fewer units. The exposure can be reduced by forming a joint venture in bidding with another firm. After making, or attempting to make, the desired modifications, a choice will be necessary. In the case of our example it will involve choosing the explicit terms under which the contract will be handled. The next step is to track the situation so that if it changes, new structuring and new choices can be made. When you have been faced with a risky business situation, what specific actions have you taken (or recommended the firm take) to reduce the risk to your firm? In particular we would like to know whether managers handle risky situations in ways similar to those we have described in the previous section. Two-thirds of the responses specified actions that adjusted the risky situation by gaining control, gaining information, or gaining time. Among these risk modifications, control and information were mentioned more frequently than time. Handling risk by gathering more information was the most common response. The most common control action was the sharing of risk by means of insurance, contingent contracts, collateral, performance guarantees, and joint ventures. Attempting to influence the source of uncertainty (by lobbying with government regulatory agencies, dealing with competitors, and using public relations campaigns) and considering more alternatives to the choices at hand were also cited as control mechanisms. Using delay to modify risk was suggested so that information could be gathered and the decision situation could be clarified. In addition to these risk modifications, about one out of three responses specified actions to control the outcomes of the risky situation as the uncertainties were resolved. These actions were all aimed at achieving the best possible outcome after the key risky decision had been made. Specifically mentioned were close management, contingency plans, limiting exposure, and staged implementation. "Confirm the facts with at least one outside source." "Demand performance and payment bonds when dealing with firms of marginal financial stability." "Delay for more information and more discussion...time clarifies." "Follow the situation closely in the early stages...be prepared to act when necessary." "Assign best talent possible to the job to manage it." "Cut losses as soon as situation seems hopeless." Thus the methods the executives used to handle risks were consistent with the risk modifications described earlier. It is clear, however, that they continued to take actions to obtain the best possible outcomes in a risky situation, even after a risky alternative had been selected. While it is hard to predict exactly what effect a particular risky situation will have on us, it clearly can influence whether we opt in or out of other risky situations, try to modify the risks in other situations, or choose a risky alternative in other situations. The results of any one situation can lead to more attention being spent on another. More careful assessment may be made or more detailed plans for implementation or monitoring can be put in place. So far in this chapter we have been discussing the commonalities of risk behavior. Everyone, to some extent, recognizes risks, evaluates risks, tries to adjust risks, and chooses among alternatives that differ in riskiness. Through casual observation, however, we can see major differences in the way people react to risky environments and risky situations. In this section we investigate some of these differences. In ordinary conversation we talk about risk takers and risk averters. Ironworkers operating at the tops of skyscrapers and heavy investors in penny mining stocks are considered risk takers, while bookkeepers and people who invest all their assets in savings accounts are considered risk averters. We all use such terms to describe people in both their business and personal activities. Yet there is no standard way to assess a person's willingness to take risks. A primary focus of this book is to clarify the meaning of these terms and to develop methods to assess risk propensity. At this point, though, we will take for granted that we can make such a distinction and we will consider differences one would expect between risk takers and risk averters. Since risk is defined as the exposure to a chance of loss, we can expect risk takers and risk averters to act differently with regard to the components of risk. Table 1.3 summarizes the risk components that risk takers accept and risk averters require. A risk taker would accept a higher exposure in the sense of taking sole responsibility, acting with less information, and requiring less control than would a risk averter. The risk taker would accept a higher chance of loss, would operate in unfamiliar situations, would tolerate more uncertainty, and would require less information about the chances. Risk takers are willing to play for higher stakes and would tolerate higher maximum possible losses. They would accept higher variability in payoffs and would proceed with less information and less control about the possible payoffs. We can also trace differences in the way risk takers and risk averters would act in the various phases of our REACT model of risk behavior. Clearly at the choice phase a risk-taker would choose riskier alternatives than would a risk averter. Earlier in the process, though, risk takers recognize lower risk in the situations they face. While risk averters tend to overrate the risks, risk takers tend to underrate risks. In evaluating risk, risk takers tend to accept the information they have on risky situations at face value. They may even adopt optimistic scenarios under the belief that chance is on their side or that they can control the outcomes. Risk averters tend to look at worst-case scenarios, bias probabilities of loss upward, and overemphasize the possible losses or their exposure. The differences are particularly prominent at the adjustment phase. Risk takers would give only cursory attention to modifying risks, but risk averters could be expected to devote considerable effort to trying to reduce risk. Risk averters would engage in as many of the modification actions described in the preceding section as could be managed. Risk averters would be more concerned about tracking how the risky situation develops after their choices so they could take further actions to minimize risks. In actual situations a person can be a risk taker (or risk averter) without exhibiting all the characteristics we have enumerated. In fact, in many situations we may observe only a single characteristic such as the size of the stake he is willing to risk and on that basis type a person as a risk taker or a risk averter. In the next chapter we will describe some of the bases we use in our empirical study to characterize a person's willingness to take risks. Different people will respond to seemingly similar risky situations in very different ways. A central focus throughout this book will be whether people can be categorized as risk takers and risk averters on the basis of these responses. Although it is common to talk about people as risk takers or risk averters, we shall emphasize the need to make such characterizations specific to particular situations. There is no a priori reason to believe that a person who takes risks in one situation will necessarily take risks in all situations. Might we not observe financial cautiousness in a trapeze performer and physical cautiousness in a commodity broker? We will use the concepts we have developed about risky situations and risk behavior to help characterize risk propensities that are contingent on situations. What other factors influence one's risk propensity? Differences in the responses made by individuals to similar risky situations could be partially caused by the individual's personal, financial, or business background. In fact several stereotypical relationships are widely cited. It is claimed that risk takers are younger and have higher wealth and fewer dependents than risk averters. Stereotypically risk takers in business are supposedly found in senior executive positions and in aggressive, sales-oriented firms. Risk averters, on the other hand, are assumed to come from lower executive ranks and are found in banks or insurance companies. We will investigate in this book whether these expectations can be confirmed. Social factors may also influence one's willingness to take risks. There appears to be a cultural bias in favor of taking risks. Thus some people may take more risks (or say they take more risks) than they are inclined to because they believe it is socially expected of them. If such a bias exists, its origins might be traced back to childhood when games of "I dare you to..." and "double dare back" flourished. Another social factor is the risky shift phenomenon that has been observed in some group settings. In the risky shift, when people who are somewhat inclined to take risks are asked to make a group decision, they collectively tend to shift toward an even greater willingness to take risks. Personal exposure to risk is perceived to be lower in the group decision than in the individual decision. This book is divided into four main parts. Part One consists of Chapters 1 and 2 which introduce the topic of risk. As we have already seen, risk is the exposure to a chance of loss. The degree of risk is determined by the lack of control, lack of information, and lack of time. We developed the REACT model to describe how an individual manages risk. A person initially recognizes and structures the risky situation, and then evaluates whether to be in a situation or to be out. He tries to adjust the risks to make the situation more desirable by gaining time, gaining information, or gaining control. After choosing a course of action, he tracks the outcomes and consequences to recognize new risky situations to consider. In Chapter 2 we describe some key results from earlier studies of risk taking. We use these results and the conceptual foundation for studying risk developed in Chapter 1 to construct a variety of new methods for assessing risk propensity. We describe a portfolio of questionnaires to provide us with information about risk behavior and risk-related characteristics in four categories: standardized risks, naturally occurring risks, attitudes to risk, and personal, financial, and business characteristics. Overall we consider more than 100 variables related to risk. We also describe our survey of more than 500 top-level business executives and the sampling method we used to contact them. Thus our study examines the risk propensities of people who get paid for handling risk. In Part Two of the book, Chapters 3 through 7, we present the results of our four main questionnaires for studying standardized risks. In Chapter 3 we embed the Basic Risk Paradigm in an in-basket format, so we can assess risk propensity via three different methods: scale ratings, probability equivalences, and open-ended memos. In Chapter 4 we use the traditional utility function method of assessing risk. We use gain equivalence questions to assess risk propensity in both personal and business investments. In Chapter 5 we present nine personal investment ventures, described in terms of key parameters of a distribution of returns, and infer risk propensity by examining a preference ranking of the ventures. In Chapter 6 we present the executives with three sets of wagers that involve real money payoffs. Within each set a different aspect of the wagers is held fixed and risk propensity is inferred from a preference ranking of the wagers. The implications of the risk behavior in standardized situations are discussed in Chapter 7. Part Three of the book is comprised of Chapters 8-11. In Chapter 8 we consider eight principal risk measures that emerge from the analysis of the standardized risks in Part Two. We examine the extent to which a person has a consistent risk propensity and whether there are commonalities among a person's risk measures in two particular domains: business versus personal and threats versus opportunities. In Chapter 9 we extend this comparative analysis to two of the other categories: naturally occurring risks and attitudes to risk. Since items from both of these categories have been used in previous studies as measures of risk propensity, we raise questions about the difficulty in interpreting results from such studies. In Chapter 10 we investigate whether the personal, financial, and business characteristics of the managers are related to the risk measures considered in Chapters 8 and 9. We explore the implications of these results for managers in Chapter 11. Part Four of the book consists of a single chapter, Chapter 12, in which the reader is invited to assess his own willingness to take risks. This chapter also examines the use of Risk Profiles to aid in personnel selection, training, and development of a risk policy for the firm. An Appendix contains selected items from the questionnaires used in the study. Business Fascinating...should appeal to all managers for whom risk is an integral part of business life. Howard Kunreuther Professor of Decision Sciences and Public Management, Director of the Center for Risk and Decision Processes, The Wharton School This is the first time that extensive data on executive attitudes toward risk has been pulled together and analyzed...Very solid...will be of great interest to business managers and consultants as well as academics in business schools. James S. Dyer Foster Parker Centennial Professor of Management and Finance, University of Texas -- Austin Taking Risks is an excellent book -- by far the most authoritative and comprehensive study of risk taking that I have ever seen. Must reading for business executives, social scientists, government officials, management scholars -- anyone who faces the real-world pressures of malting decisions or seeks to understand the processes behind them.